Winter never took hold in Washington, D.C., this year. So it was with our spring jackets that we greeted the U.S. Department of Agriculture’s first new Plant Hardiness Zone Map in 22 years on January 25. Here and there, you could see daffodils already in bloom. The scene couldn’t have been more appropriate. According to the new map, large parts of the United States—including some neighborhoods in the nation’s capital—are now a half zone warmer than they used to be. The hardiness zones help determine which plants will survive the winter in a given area of the United States. The map approximates the average minimum temperature as it divides the country into 10 degree Fahrenheit zones, which are further divided into 5 degree Fahrenheit half zones—marked by a number and the letter a or b. The National Mall, once located in USDA Zone 7a, is now in the warmer Zone 7b. Atlanta, Dallas, and Tampa, Florida, have all moved into warmer zones as well. TheWashington Post created a great interactive graphic on its web site that shows how the map has changed, and the transformation is quite breathtaking. But before you start tearing out perfectly healthy plants or using the hardiness maps in presentations to demonstrate climate change, there are a few things you should know. This latest map was long in coming. Around a decade ago, the USDA contracted with the American Horticultural Society (AHS) to develop an updated plant hardiness zone map. The AHS released a draft of the new map in its magazine, The American Gardener, and on the society’s web site in 2003. But that map was never adopted. Some people, particularly in the blogosphere, have theorized that the AHS map was rejected owing to the politics of climate change during the Bush administration—like the map released in January, it showed major shifts in hardiness zones. Kim Kaplan, a spokesperson for the USDA’s Agricultural Research Service, tells a different story: “By the time they provided a new map, GIS mapping had become state of the art, and unfortunately what AHS provided was not GIS compatible.” It was a single-layer EPS file that was too big to be Internet friendly and couldn’t easily be integrated into scientific models as a data layer for research, she says. 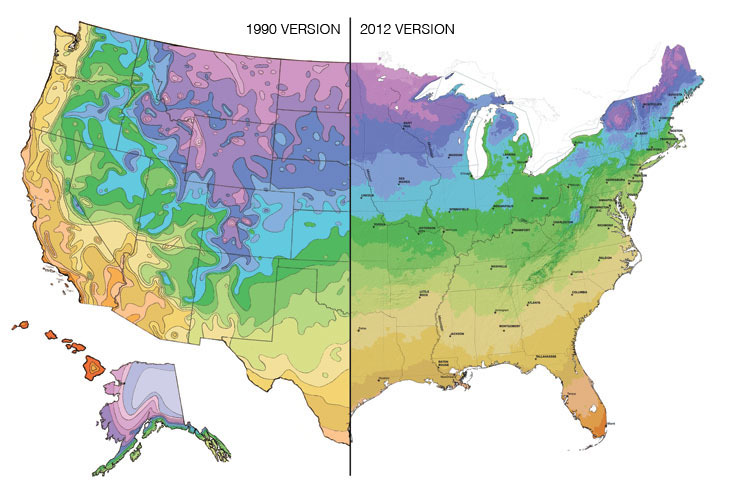 Another problem with the 2003 map, some in the nursery industry said, was that it was based on the average minimum temperature over just 16 years (1986 to 2002) that didn’t include many harsh winters. David Ellis, the editor of The American Gardener, says some nursery owners were concerned the map could give people a false sense of security. The trend seemed to be toward warmer winters, but what if there was a particularly harsh one? There was concern that the new zones would encourage people to plant things that were borderline hardy and blame the nurseries when those plants failed. With all this in mind, the USDA started over, this time with PRISM Climate Group at Oregon State University. Using GIS technology allowed for a degree of accuracy not present in previous versions of the map. “The 1990 map was drawn by a graphic artist with a straightedge,” says Kaplan. All of North America was shown on a poster four feet square—so you can imagine the resolution wasn’t very good. The new map allows you to zoom in and see the area you want to plant. It’s available for free online at about one-half-mile resolution. The new map, which is limited to the United States and Puerto Rico, uses 8,000 weather stations in the United States; the old map used about 8,000 stations in all of North America. Rather than just interpolating between the stations, PRISM developed a complicated algorithm that weighted a variety of factors including the elevation, the slope of the land, and prevailing winds to figure out where the zone’s boundaries should be drawn. Then, the USDA sent out a draft of the map to experts all over the country to review. “There was one place where they said it looks too cold and, lo and behold, all the weather stations in that area were from tops of mountains,” Kaplan says. In the Northern Plains, along the Canadian border, there were some odd patterns caused by a lack of weather stations, so they added some stations in Canada. “We didn’t make changes just because somebody didn’t like it,” Kaplan says. Rather, they used the information gathered on the ground to make sure the data was properly gathered. When the map was finished, some places had shifted into colder zones, a result of improvements in resolution and methodology. For example, Pierre, South Dakota, is now half a zone colder. But the clear trend was one of warming, as colder zones retreated northward across the country. USDA zones are, of course, only one of many tools necessary to determine whether a plant will survive and thrive in a certain place. “Parts of southwestern Arizona and parts of northwest Washington state are in the same USDA zone,” notes Kathleen Norris Brenzel, the editor of The New Sunset Western Garden Book (see “Guide to the Golden West” in the April 2012 LAM). They may have similar winter extremes, but the climate in these places is very different otherwise. That’s why Sunset has created its own custom climate zones and others use the USDA’s zones in concert with other information—like the AHS’s Heat Zones. Knowing how a plant is adapted to the sunlight, water, humidity, and soil conditions present on site is also key. Kaplan notes that many of the places that have moved into a new zone are just barely in that new zone. “Tampa, Florida, moved from zone 9b to zone 10a, but the actual average low there is 30.4 degrees,” she says. If your garden or a project you are designing is now in a warmer zone, but just by a mile or two, you may not want to risk designing a whole new garden around warmer zone plants. Sean Hogan, a nurseryman from Oregon, raises another issue. Hogan edited Timber Press’s 20,000-entry plant encyclopedia, Flora. He explains that the USDA’s hardiness zones are not based on extreme events—the same way a 100-year flood line would be. They are based on averages. In some cases, it’s important to look at 10- to 15-year temperature extremes, he says. “If you’re planting a $300 yucca and every 10 years you go below its tolerance, be prepared to protect it.” Or, better yet, choose something else. Another issue is that many plants have not been tested extensively. “There are plants that have been in horticulture for hundreds of years, and, boy, do we know what they’ll take,” says Hogan. “But there are a lot of companies pumping out new perennials, and we might have a general idea [of the zones they will thrive in] but no real knowledge.” And it is important to remember that plants are living things that are each a little different from one another—at least the ones that aren’t clones. Some red maples are more suited for cold climates, whereas others will thrive in the South. The bottom line: It’s a lot of fun to experiment and push your zone in your own garden, but when you’re designing a garden for someone else, it never hurts to be cautious. Don’t base your whole design around a plant that is at the edge of its known comfort zone unless you are really familiar with it. Looking at the old and new hardiness maps, side by side, many people are tempted to use them to argue that climate change is occurring. Jason Samenow wrote on the Washington Post’s Capital Weather Gang blog that he is frustrated that the USDA “won’t state the obvious: the shift [in zones] is a rock solid indicator of climate change.” Others have expressed similar concerns. But Kaplan of the USDA says the hardiness maps just aren’t a very good tool for measuring climate change, one way or another. “The methodologies [used in] the 1990 map and the new map are so different that comparing them is not scientifically sound,” Kaplan says. The 1990 map used only 13 years of temperature data—1974 to 1986. And the winters of 1977, 1978, and 1979 were notoriously cold in many parts of the country. In each of those years, more than half of the weather stations in the contiguous United States had minimum lows that were among the 10 coldest in the past century, according to the National Climatic Data Center’s U.S. Climate Extremes Index. The new map is based on 30 years of data—from 1976 to 2005, so those unusual winters are given less weight.